In feudal Japan, evil spirits known as mononoke plague both households and the countryside, leaving a trail of fear in their wake. 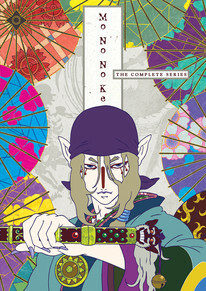 One mysterious person has the power to slay the mononoke where they stand; he is known only as the Medicine Seller, and he vanquishes the spirits using the power of his Exorcism Sword. However, in order to draw his sword he must first understand the Form, Truth and Reason of the mononoke. Armed with a sharp wit and keen intellect, the Medicine Seller wanders from place to place, striking down the evil spirits in his wake.